​Copa: Why did you establish the Roll Call Crew? ​Mark: I have to laugh when I’m asked that question, and, I’m asked that often, because in as much as I’d like sound selfless about my motives, I started the RCC for me. I was at a point in my training where I felt I needed external motivation. I hit a snag and thought, why don’t I make me accountable to someone else. So, I took to social media, named it Roll Call Crew (the process of calling out a list of names to establish who is present) and posted my journey on Facebook. A few friends liked the idea and asked that I Tag them on the Post. A couple grew to about 12 friends Tagged and it got pretty cumbersome on individuals personal pages. I posed the question, how would you like for me to start a Closed Group and we do our bidding there? The answer was a resounding YES. Copa: Please describe the membership. ​Mark: Let’s see…who are we? 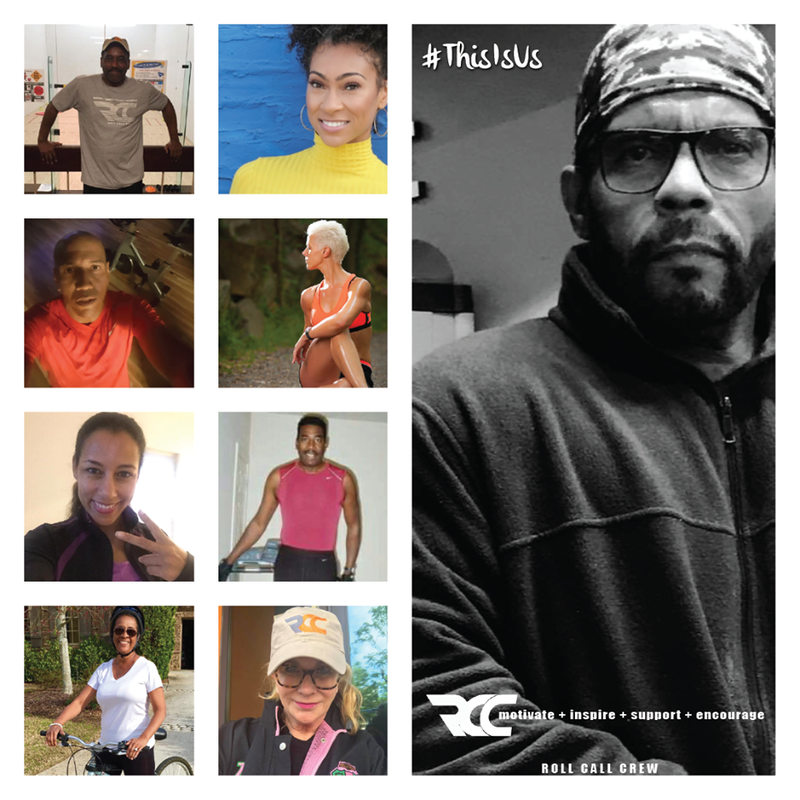 The RCC is a diverse group of individuals seeking to lead a healthy lifestyle. We are beginners, we are fits and starters, entrepreneurs, personal trainers, runners, gym owners, nurses, doctors, lawyers, radio and TV personalities, college professors, college students, professionals and Uber drivers, vegans and carnivores. We even have Editor’s-In-Chiefs of a lifestyle magazine. The fact is, we represent a microcosm of society. We Are Everyone! Copa: Who would be the typical member and what makes the RCC stand out from the other health and fitness groups? ​Mark: The typical member is anyone who has decided to TRY to live a healthy lifestyle. And, I guess we can be described as a health and fitness group, though I like to think of us a motivational cluster. In fact, we carry a few mantras in the RCC; ‘Do What You Can – When You Can and M-I-S-E which stands for Motivate-Inspire-Support-Encourage. This is what we live by…No, this is who we are. We espouse to a ‘top-down’ theory on health and fitness. It starts upstairs. You gotta git ‘yo mind right. In that regard, we might be different without distinction. It’s all LIFE, man. Copa: In your opinion, why do you think more people don’t get started and how can the RCC assist with their motivation? Mark: There are innumerable reasons people don’t get started, but the two most obvious reasons are mind and body. I’ll say it again, ‘you gotta git ‘yo mind right’ to affect your overall physical health. There’s a saying, “excuses are lies we tell ourselves so that it doesn’t have to be our fault.” The point is, we can find every good reason not to get started and thus, we don’t. The RCC is, in essence a group of, what we like to call ‘accountability partners’. On those days you can’t seem to find it in yourself to do something, on those 50/50 days when you could see yourself getting to the gym, but maybe not; we are here for you. I know I experience those days and when I do, there comes a notification on my phone or computer that alerts me there are RCC’ers in the gym, walking, jogging, playing tennis, being active, or eating something healthy that kicks me into gear. That is what the RCC group dynamic provides. You take what you need. Copa: What is the main importance of everyone to become more concerned with their heart rate and blood pressure, especially after the age of 50? ​Mark: Let me expand your question to include what is known as The Four Primary Vital Signs; they are: Blood Pressure, Heart Rate, Body Temperature and Respiratory Rate. It’s important because those are the simple indicators by which we live. Understand, these are the base level indicators, your doctor will be more extensive with his physicals. I want to also remind you that the term normal ranges for a person’s vital signs vary with age, weight, gender and overall health, not to mention, genetic markers (your family history of illness). Sounds like a lot, but the more you practice a healthy lifestyle, the likelihood is that you will be in better health and subsequently find yourself within these normal ranges. In brief, everyone should consider the huge importance of their vital signs, though the older you become, the more aware you should be, because our body’s tolerances wane as we age. Copa: How often during a week should one workout and what type of regimen would you recommend? ​Mark: First, let me say, I didn’t make this stuff up. There are people much smarter than me that have studied the physiology and kinesiology of the body and have determined what makes it perform efficiently and the information is always evolving. That said, it is suggested that everyone should try to get in 30 minutes of cardio at least three times a week and resistance training two to three times per week. The American College Of Sports Medicine takes the position stand, titled Quantity and Quality of Exercise. The ACSM recommends: Cardiorespiratory Exercise, Resistance Exercise, Flexibility Exercise and Neuromotor Exercise (sometimes called ‘functional fitness training’). Copa: What is the best way to track progress over time with a steady regimen? ​Mark: That’s a tricky question. There are many ways to track your progress, keeping in mind you should be careful with tracking. You can become easily disenchanted with your gradual improvement. One of the simplest methods of tracking is ‘the clothes method’; how you feel in your clothes or able to wear something you haven’t been able to get into for some time. Another obvious is the scale. The scale can become your friend of foe. For this reason I don’t suggest you rely on it and, learn to use it. By that I mean, you might want to schedule your scale visits weekly as oppose to daily, and at the same time of day. And lastly, there are many activity trackers available on the market that are very good with tracking your steps and even respiratory rate. Copa: How can one join the RCC? ​Mark: The Roll Call Crew [The RCC] is a Closed Group on Facebook, for now. So, if you’re not on Facebook, you’re out of luck. We typically have members sponsor or Add members to the group. We’d like to know that the prospect profiles towards the like-minded individuals we have in the group. But, as a Closed Group, Facebook will randomly recommend the RCC in the News Feeds. We’ll average about 15-20 ‘Ask To Join’s’ a month. You’ll have to answer four questions when asking to join, the most important being; Do You Commit To Living A Healthy Lifestyle? Copa: Are there any plans to expand the group on the East Coast and what does the future hold? ​Mark: We actually started up on the East Coast, though we are a national organization. We exist in every major U.S. city, eighteen states, Bermuda and Nassau, Bahamas. That’s the advantage of having a social media based group. To infinity and beyond! Only the shadow knows how long we’ll be around. I have asked more than a few times, what’s next? Honestly, I don’t know. I prefer to let it be organic. We are, however, always trying new things to keep the page fresh. We involve ourselves as a team in bike rides, run/walks, RCC Meet-Ups (two or more RCC’ers get together and workout or even share a healthy meal) and our latest concept is RCC Goes LIVE. A once-a-month Facebook LIVE event where we utilize the groups vast expert personnel to speak on various topics. It’s exciting to see members talking about what it is they do; and that is imparting valuable information. ​Mark: Thanks Rodney for giving me the opportunity talk about something I am super-passionate about…The RCC!